Taylor Streit was wading the fabled waters of New York’s Catskills before he was 10; then tying flies commercially and guiding in his teens. He moved to Northern New Mexico in the late 60s where—after “several minor careers and lifestyles”—opened Taos Fly Shop. 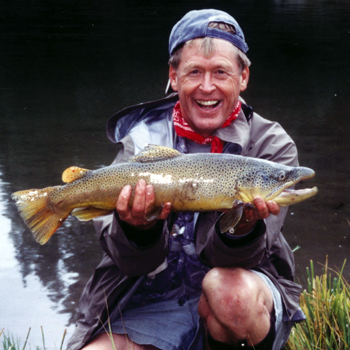 Taylor Streit has been guiding fly fishers for over 40 years. After watching thousands of clients catch trout over the years he knows what works and what doesn't work. Join us to learn Taylor's secrets to hooking up and landing more trout. In 2001 he was unanimously inducted into the Freshwater Fishing Hall of Fame as a legendary guide. He’s authored four books: Fly Fishing New Mexico, Man vs Fish—The Fly Fisherman’s Eternal Struggle and Instinctive Fly Fishing I and II. He holds fly fishing schools annually and writes and photographs for various magazines and newspapers. He has developed a number of fly patterns—including the mighty Poundmiester. He lives in Taos, New Mexico near his favorite river-- the wild Rio Grande. He works with his son Nick in Taos Fly Shop and runs the guiding side of the business.